Orvon 'Gene' Autry (September 29, 1907 – October 2, 1998) was an American cowboy singer and actor who gained fame as the first "Singing Cowboy" on the radio, in movies and on television. He had many hit records, including his signature song, “Back in the Saddle Again,” and his biggest hit “Rudolph the Red-Nosed Reindeer,” which is still a favorite holiday record today. He starred in scores of western films, and also played the lead in a popular television series. After retiring, Autry had a successful career as a businessman and baseball owner, appearing many times on the Forbes magazine list of the four hundred richest men in America. He also founded the Museum of the American West in Los Angeles. Autry was married for 48 years to Ina May Spivey, who died in 1980. He married his second wife, Jackie, in 1981. He had no children by either marriage. To date, Autry is the only person to have five "stars" on the Hollywood Blvd. "Walk of Fame," one for every possible entertainment category. Autry, the grandson of a Methodist preacher, was born near Tioga, Texas. His parents, Delbert Autry and Elnora Ozmont, moved to Ravia, Oklahoma in the 1920s. After leaving high school in 1925, Autry worked as a telegrapher for the St. Louis–San Francisco Railway. An amateur talent with the guitar and voice led to his performing at local dances. After an encouraging chance encounter with the famed "cowboy philosopher" Will Rogers, he began performing on local radio in 1928 as "Oklahoma's Yodeling Cowboy." Autry signed a recording deal with Columbia Records in 1931. He worked in Chicago, Illinois on the WLS radio show National Barn Dance for four years with his own show where he met singer/songwriter Smiley Burnette. Their partnership would last decades and extend from musical collaboration into a lucrative film career. In his early recording days, Autry covered various genres, including a labor song, “The Death of Mother Jones” in 1931. His first hit was in 1932 with “That Silver-Haired Daddy of Mine,” a duet with fellow railroad man, Jimmy Long. 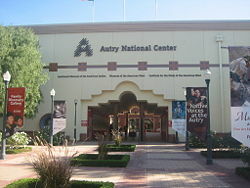 Autry also sang the classic hit “I'm Back in the Saddle Again.” Autry recorded numerous Christmas carols, including "Santa Claus Is Coming To Town" and—probably his biggest hit ever—“Rudolph the Red-Nosed Reindeer,” which carried over from its Christmas-season debut to become the first number-one hit of the 1950s. The cowboy must never shoot first, hit a smaller man, or take unfair advantage. He must never go back on his word, or a trust confided in him. He must always tell the truth. He must be gentle with children, the elderly, and animals. He must not advocate or possess racially or religiously intolerant ideas. He must help people in distress. He must be a good worker. He must keep himself clean in thought, speech, action, and personal habits. He must respect women, parents, and his nation's laws. The cowboy is a patriot. Discovered by film producer Nat Levine in 1934, he and Burnette made their film debut for Mascot Pictures Corp. in In Old Santa Fe as part of a singing cowboy quartet. In 1935, Autry was given the starring role by Levine in the 12-part serial The Phantom Empire. Shortly thereafter, Mascot was absorbed by the formation of Republic Pictures. Autry would make an additional 44 films, all B westerns in which he played the character "Gene Autry," rode his horse Champion, used Burnette as his regular sidekick, and had several opportunities to sing in each film. He had become the top Western star at the box-office by 1937, reaching his national peak of popularity from 1940 to 1942. Autry was the first of the great singing cowboys, succeeded as the top star by Roy Rogers when Autry served as a flier with the Air Transport Command during World War II. 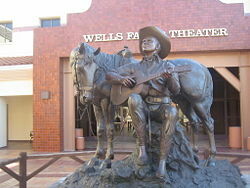 From 1940 to 1956, Autry also had a weekly radio show on CBS, Gene Autry's Melody Ranch. He also launched the Gene Autry Flying "A" Ranch Rodeo show, which debuted in 1940. Autry briefly returned to Republic after the war to finish out his contract, which had been suspended for the duration of his military service. Thereafter, he formed his own production company to make westerns, which were distributed by Columbia Pictures, beginning in 1947. He also starred and produced his own television show on CBS beginning in 1950. Autry retired from show business in 1964, having made almost a hundred films by 1955 and over six hundred records. Post-retirement, he invested widely in real estate, radio and television, including buying the copyrights from moribund Republic Pictures for the films he had made for them. He also became a well-know baseball team owner. In 1960, when Major League Baseball announced plans to add an expansion team in Los Angeles, Autry—who had once declined an opportunity to play in the minor leagues—expressed an interest in acquiring the radio broadcast rights to the team's games. Baseball executives were so impressed by his approach that he was persuaded to become the owner of the franchise rather than simply its broadcast partner. The team, debuting in 1961, was the Los Angeles Angels, a name previously used by a popular Pacific Coast League team. The team had a number of name changes after moving to suburban Anaheim in 1966, where they became known as the California Angels. 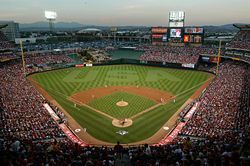 The team was called the Anaheim Angels from 1997 until 2005, when they became known as the Los Angeles Angels of Anaheim. Gene Autry served as vice president of the American League from 1983 until his death. In 1995 he sold a quarter share of the team to The Walt Disney Company, and a controlling interest the following year, with the remaining share to be transferred after his death. Earlier, in 1982, he sold Los Angeles television station KTLA for $245 million. In 1964, KTLA was purchased by Autry and merged with his other radio properties (including Los Angeles' KMPC) into an umbrella company, Golden West Broadcasters. KTLA was sold to an investment firm and then became a leading independent television station. Autry was elected to the Country Music Hall of Fame in 1969 and to the Nashville Songwriters Hall of Fame in 1970. In 1972, he was inducted into the Western Performers Hall of Fame at the National Cowboy & Western Heritage Museum in Oklahoma City, Oklahoma. His autobiography was published in 1976, co-written by Mickey Herskowitz; it was titled Back in the Saddle Again after his 1939 hit and signature tune. In 2003, Country Music Television ranked him #38 in CMT's 40 Greatest Men of Country. When the Anaheim Angels won their first World Series in 2002, the championship was dedicated in part to him. The interchange of Interstate 5 and California State Route 134, located near the Gene Autry Museum of Western Heritage, is signed as the "Gene Autry Memorial Interchange." The Museum of the American West in Los Angeles' Griffith Park was founded in 1988 as the "Gene Autry Western Heritage Museum," featuring much of Autry's impressive collection of Western art and memorabilia. It has become a respected institution, preserving the essence of everything related to the "mythic aspects" of the American old west—everything from true historical lifestyles, to the 70-year history of the Hollywood western movie genre. Included for many years on Forbes magazine's list of the four hundred richest Americans, he slipped to their "near miss" category in 1995 with an estimated net worth of $320 million. Gene Autry died of lymphoma on October 2, 1998 at age 91 at his home in Studio City, California. He is interred in the Forest Lawn Memorial Park in Los Angeles. Autry was inducted into the Radio Hall of Fame in 2003.
motion picture star—located on 6644 Hollywood Blvd. radio star—located on 6520 Hollywood Blvd. recording star—located on 6384 Hollywood Blvd. TV star—located on 6667 Hollywood Blvd. live theater star—located on 7000 Hollywood Blvd. In 2004, the Starz Entertainment Corporation joined forces with the Autry estate to restore all of his films, which have been shown on Starz's Encore Western Channel on cable television on a regular basis ever since. All links retrieved May 25, 2017. This page was last modified on 25 May 2017, at 16:26.